ST. GEORGE — Region 9’s volleyball teams had a rough opening day at the state 4A tournament Wednesday, with two schools losing in the opening round and the other two in the second round. Playing at Utah Valley University in Orem, top-seeded Snow Canyon from Region 9 made it past Mountain Crest Wednesday morning, despite losing the first set to the Mustangs, 23-25. The Lady Warriors rebounded to win the next three sets, 25-18, 25-14, 25-13, and capture the match. 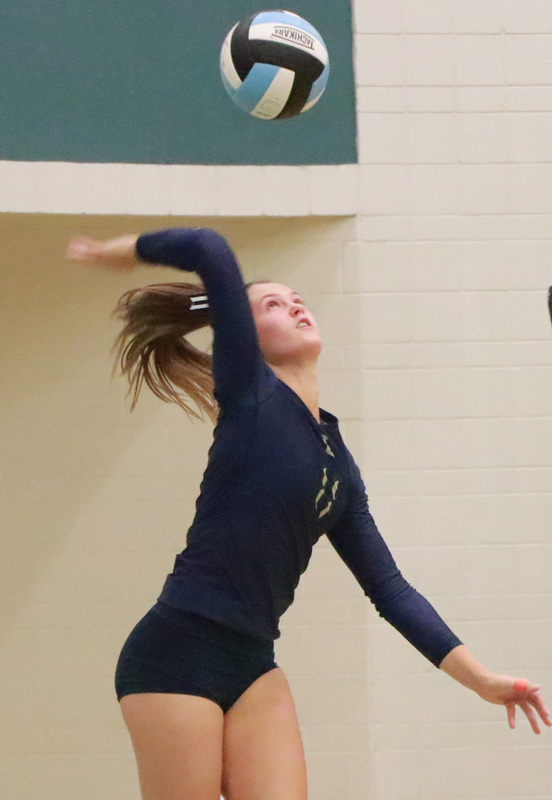 That victory put Snow Canyon in a second-round match against Salem Hills, Region 10’s No. 2 seed. The Skyhawks edged past Snow Canyon 26-24 in the first set, then went on to take the next two sets for the sweep, 25-19, 25-16. Although teams are technically not eliminated from the tournament until they’ve lost twice, once a team loses a match, it is no longer in contention for the championship, and instead plays for consolation spots. Having dropped into the one-loss bracket, Snow Canyon must win its next game Thursday morning for a chance to play for fifth or seventh place later that afternoon. Region 9’s No. 2 seed, the Desert Hills Lady Thunder, faced a tough Green Canyon team in Wednesday’s opener. All four sets were close back-and-forth battles marked by several tie scores throughout, but the Lady Wolves prevailed, 25-22, 25-23, 23-25, 25-23. After dropping into their consolation bracket, Desert Hills bounced back to sweep Bonneville 3-0 (25-11, 25-19, 25-15). The Lady Thunder will next play Ridgeline Thursday morning for a chance at the sixth-place game. The other Region 9 team to win its opening game Wednesday was the third-seeded Dixie Flyers, who upset second-seeded Ridgeline 3-1 in four close sets, 23-25, 30-28, 25-23, 25-23. Dixie narrowly lost the first set but bounced back to win the next two. Then, in the fourth set, the Flyers found themselves down 19-15, only to rally to tie the game 19-19. Later, with the score tied 23-23, Ridgeline served the ball into the net, after which Dixie served up the match-winning point. Dixie’s first-round win placed them in a showdown against Park City, the top seed from Region 11. The Lady Miners ended up sweeping Dixie, 25-16, 25-22, 26-24. The loss dropped the Flyers into the same consolation bracket as Snow Canyon. Cedar High, the fourth and final team from Region 9 to qualify for the state 4A tournament, lost both of its matches Wednesday and was eliminated. The Lady Reds fell to top-seeded Sky View in the opening match, 12-25, 15-25, 22-25. They then dropped into the consolation bracket, where they faced Juan Diego Catholic High School. Juan Diego won the first set 26-24, after which Cedar took the next two sets, 25-22 and 25-19. The Soaring Eagle then captured the fourth set 25-19, sending the match to a fifth set. The deciding game was close, but Juan Diego prevailed, 15-12. The four teams still in contention heading into Thursday’s semifinals were Sky View, Salem Hills, Lehi and Park City. Sky View swept Park City 3-0 in the championship game. Click here to view bracket, including complete results for both days. Updated Oct. 25, 8 p.m. to include Thursday’s results. Desert Hills defeated Ridgeline, 3-0. Desert Hills defeated Stansbury, 3-0 in the sixth-place match. Snow Canyon lost to Spanish Fork, 1-3. Dixie lost to Green Canyon, 2-3. Here you go again, doing more sports Stories when people don’t even understand them. What’s region 9 or 4a anyways? made up words. Too many numbers in this story. There are a lot of people, including me, who appreciate all of the sports updates! We enjoy seeing youth succeed in various events and love following the schools communities! Thank You St George News – Keep up the great work!